Yes we have laid low for a few days and drowned in our sorrows. We can't understand why the canals we're so low with all these tears in the south. Len's funeral was yesterday and it turned into quite a big occasion. Del and his brothers carried Len to the church to the music of "You're my Best Friend" by Don Williams, and were greeted by 180 guest's. Al read the eulogy which she did with style and professionalism, and brother Cliff's children all did a small message for their grandad.. After a couple of hymns we made our way on to the crematorium, where we followed Del and his brother's into REM's "Everybody Hurts". Jay, another grandson, did a reading before we sat and listened to Len's favourite country song "Who Needs Pictures with a Memory like mine" by Brad Paisley. We then walked out to be greeted by the fantastic array of flowers to the music Simply the Best by Tina Turner. 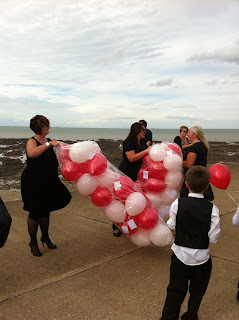 The Wake was held at Westgate Pavilion right on the sea front, a favourite spot of Len's. We all sat listening to Len's favourite songs eating his favourite food (including his cakes). On the stage we had transported all his flowers and in the middle was a projector screen showing all the photos of all his friends and family. 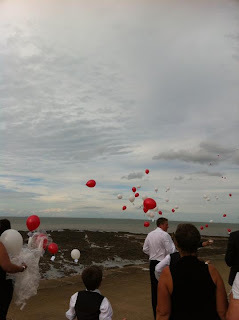 The sun had been over us all day and in the afternoon we walked down to the waters edge and let of fifty balloons all with messages to Len on them and we watched them go high into the blue sky until they were out of sight, it was lovely! After we had finished at the pavilion we walked over to The Swan pub to toast one last time for Len, and as we did so, we just watched the most amazing sunset; another fabulous memory. We then got the flowers back to the bungalow and we had a small shower from the sky to water them, and a rainbow appeared. Thanks Dad for a Fantastic Day which everyone enjoyed, it was sad but happy at the same time. You have been a fabulous mentor for our family and your memories will always live on!!!! Phew! (and a deep breath) what can we say.... Thank you so much for all your lovely comments and condolences, we are truely overwhelmed by the support we have received. Your lovely comments have made us smile and cry, but have also given us great comfort. Our family has been in very close contact as we all support each other, and we can all still feel Len's presence in the air. Making the most of every minute as usual, we were all up early on Saturday. Everyone knows how much Len is a Charlton FC fan and has been for over fifty years. Steve (one of Del's mates) had managed to get five tickets through his company Axis, and due to the situation they had given us them for free. Len was not going to miss a chance to see his favourite side again, so we bundled in the car and travelled the couple of hours in the car to the ground. We were able to park the car in the players car park and managed to get seats right next to the managers dug out. When they played the Charlton theme tune "When the Red Red Robin comes Bob Bob Bobbing along" tears were in Lens eyes, it was just a fabulous sight. Len even wanted a bet on the scores as he used to do every Saturday, but no one got the scores right as Charlton won 3 - 0. This did wear him out for the rest of the day, but luckily some friends Dave and Lynda had brought a BBQ round and it was ready to eat when we got back. On Sunday, loads of family and friends travelled down as it was the Margate Carnival, so at midday they all found a perfect spot and set up a marque. The sun came out and they had a great day. Del and Al took the opportunity to go back home to Derwent6 and see how things were. Apart from a few cobwebs things were fine, so we gave her a big spring clean (Del didn't do the brasses though). We were back at Len's at 8.00pm. So how is he..Well he is a lot weaker and now can't walk very far. He gets tried and falls to sleep at anytime, anywhere. He also finds it difficult to swallow and has a nasty cough. But he is still good fun to be with and wants to get out as much as possible. Just a quick update.....Len has now had to reduce his steroids and some of his symptoms have come back, such as loss of balance and tiredness, but has it stopped us going out...no way!!!! He has been taken to a pub lunch every day often with bands playing and he has been to the Margate Turner centre and we went to the Broadstairs Folk Festival yesterday, and met Rob and Polly. We all even got on telly.. we were on South East news today, last night..
As everyone is aware this blog is for friends and family to see what we are up to and perhaps we should call it Len at the moment. But it saves a phone call and keeps people updated, and believe us time is precious. We have seen some slight changes in Len. He doesn't feel with it all the time and his walking is getting more difficult, but he is still his jolly old self.